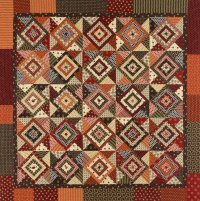 Market Square quilt kit features Paula Barnes' Retro Geo fabric line and is constructed from her Market Square pattern. The kit includes all the fabric to piece the top, binding and pattern. This bright and stunning quilt is fun and easy to make finishing at 78" square. Wendy, Andree and Penny have returned as conquerers of Fall Quilt Market with their spoils. We have an abundance of marvelous and superb products you are going to love. The HIQ staff is in love with it all. Your chance to see the big reveal and to have first dibs is at Quiltapalooza on Sunday, Nov. 24, beginning at 2 p.m. We had more than 70 people show up to the spring Quiltapalooza, so you'll want to get there on time! 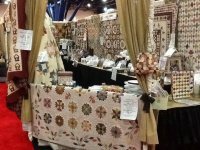 We're staying for the fun this year at Quilt Festival in Houston! Our booth is busting at the seams with kits and patterns from our amazingly talented friends from Down Under. Stop by booth 748 on October 30 - November 3 to see Sue Daley of Patchwork With Busyfingers, Deirdre Bond-Abel and Leonie Bateman of Quilted Crow Girls, and your favorite quilt shop staff. See you there. We will be closing at 4 p.m. on Halloween to make way for all the little trick or treaters during Scare on the Square. We will resume normal business hours on Friday, Nov. 1. All Halloween Fabric is 50% off! We are having a Boo of a Deal! All our halloween fabrics are now 50% off! Get yours before they haunt away. Join Cindy Sharp on Saturday, Nov. 2, from 10 a.m. - 4 p.m. to make her Moda Bakeshop Recipe S'More Mountain. Cindy will share with you her techniques for making this fun quilt. This quilt will make you want to take a road trip! Register today. Dress up like your Thanksgiving favorites! We will be showcasing four different quick Christmas gifts with one of them being an adorable wool felt jingle bell ball ornament. This is also the craft so, please bring your full sewing kit with you. We are still collecting composition notebooks for the elementary school. First Sunday begins at 2 p.m. and please remember to sign up before hand so we know how many kits to prepare. See you there! We running out on several colors, so get yours today!